Lately, I have been having great success with autosomal DNA for African American genealogy research. This has been especially true at AncestryDNA with the plethora of trees attached to the DNA matches and the ease of identifying and analyzing patterns with the new search filters and Jeff Snavely's great tool. What was once a dream for African Americans searching for their roots prior to Emancipation is finally becoming a reality. "Did AncestryDNA prove to be genealogical helpful? Would you recommend it to others in spite of its shortcomings?" "I’ve thought long and hard about this question. For me, AncestryDNA restored my lost heritage and helped me complete an important journey I began many years ago. For years beginning in the mid 1960s I was the only African American male in my school in central Michigan. It was difficult and on more than one occasion I endured being called the “N” word, but in the 5th grade I had an exceptional white teacher who cared more about teaching than anything else. She took an interest in me that no other teacher had. I remember her excitedly telling me something about my score on some intelligence test and that she moved me into advanced classes. Years later, I earned a bachelors degree from the University of Michigan Ann Arbor at the age of 19 and eventually became one of the youngest lawyers in my state. Anyway, one of the assignments that this teacher gave the class was to go home and find out why our ancestors had come to America. I had never thought about that one, but I was later disappointed to hear my parents tell me that we were just “American Negroes” and we came here as slaves. The depiction of slaves in my school books from which they were teaching mainly white, northern children was that slaves were badly clothed, unkempt people with smiling, but dumb expressions on their faces. Supposedly they were slaves because they liked the hot sun and weren’t good for much else. What a horrible and false image to put in a book for children! And how many people still believe that image because that’s what they were taught in school? When I returned to class the teacher asked each of us what we’d learned. My sense of embarrassment and inferiority deepened. Some kids had ancestors from wonderful sounding places like Ireland and France. Some had ancestors who came on the Mayflower. Others had ancestors who fought for independence. I had no countries of origin of which to boast, only negative, stereotypical images taught to us in our school books. My parents were concerned. A few years later in the early 1970s or late 60s, my step dad saw an article in the newspaper that a man named Alex Haley was coming to speak on tracing your family tree. The epic Roots had not been completed and most people would not have recognized Haley’s name. I went to hear him and learned much. I followed his advice for years afterward and learned of my courageous slave ancestors who escaped to Canada on the Underground Railroad and who helped free others. I also learned of my mother’s grandfather who was born a slave but became a newspaper publisher and one of the first black lawyers in his state. And there were many others who clearly debunked the monstrous lies behind the negative images of slaves they taught me and the largely white student body in my school. But even with what Haley taught me, there were many, many brick walls. I couldn’t discover where in Africa my ancestors came from or when. Then came AncestryDNA. First it revealed to me that my ancestry was almost equally divided between Europe and West Africa. It told me of ancestral origins in Benin or Cameroon. Other services also identified Senegal. But AncestryDNA also revealed the family connection between my slave ancestors and those who enslaved them. It brought me full circle back to the fifth grade in revealing ancestors in my past just like the other kids boasted of all those years ago. It led me to my ancestors from England, Ireland, France and other places. There was a Mayflower passenger. There were ancestors I shared in common with George Washington, Thomas Jefferson and even President Obama. So, in answer to your question, is AncestryDNA worth it? Absolutely! For me, it's a life changer and one of the most important things I've ever experienced. 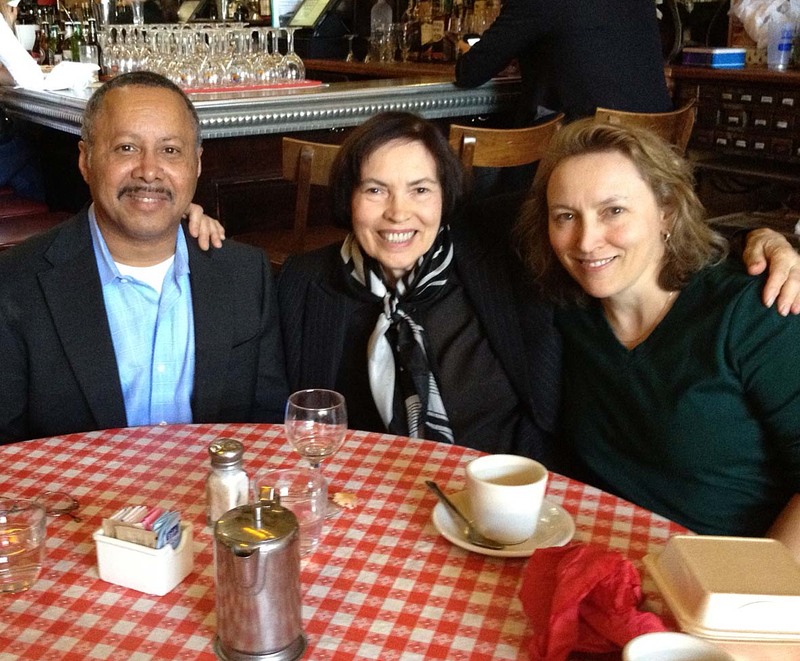 Charles met his previously unknown cousins Lynne Goransson and her daughter Dr. Leslie Goransson through Ancestry.com. They are related through a slaveholding ancestor. DNA knows no shame or pride - it gives you the facts, the untidy truth of where you originate and sometimes the glory of a happy history. We are all human and our ancestors were just like us. I love the fact that there is no illusion to what is there with DNA. You just need to keep looking, and with some compassion, realize that our forebears made choices,some good, some very bad-just like today. You have to be brave to chase the DNA - you don't know what is there, but you can be sure it will be interesting. In my family, an illegitimate pregnancy made a woman in 1879 face terrible shame, but then, it would not be that different in many more more recent generations (like 1950!). In 2013, life for her would have been much different and she would face no judgement from her 2x great grand-daughter...but figuring out what happened (she refused to name the father on the birth cert) has taken DNA as a tool for me and I am still rooting it out. There is a story here and I want to know who he was - there are so many surnames that come up in all my DNA profiles that don't appear in my own extensive tree -- are they his (the father's) family? Will they point me to the right William Ward in Lincolnshire, England in 1879? DNA is my only hope to find the cousins that are also unaware of me. I doubt any of us care what happened in 1879, but to find family -- priceless! Beautifully stated, Barb! I agree with everything you said here. DNA is uncovering all sorts of secrets - both good and bad. I think eventually most of our family mysteries will be solved through DNA. Thanks for commenting! Barb, with CeCe's permission, I'm replying to ask that you contact me via email so I can ask you a follow up question, please. My email address is legalgenealogist (at) gmail.com. Thank you! Thanks for the info on the above tools. I made a comment about the doors this opened on an earlier blog by mistake. I want to say that Charles Holman is a very lucky person to hang in there all these years and discover who he really is. I am searching too, and I am trying to find out who my grandmother's real parents are? We have solid genealogy on paper, but as a white person, I have African DNA of about 6% which means that my grandmother's family descended from slaves in Louisiana or Alabama. She was born in New Orleans. More than likely my grandmother's ancestors were French-Canadian and Creole. I was able to determine which grandmother the African-American came from by testing two sets of 1st cousins, one set on my mother's side and one set on my father's side. So as you can see there is a reverse-side to slavery and it also affects other ethnic groups. Great response by Mr. Holman. Thanks for sharing, CeCe! Thanks for getting the permission to share this experience of Charles Holman, CeCe. I remember secretly researching African American history each Saturday in the public library from the time I was in the fourth grade. I checked out books on Frederick Douglass, Booker T. Washington, and others. I kept these book with me during the week, and read them during my spare time in class. They were different from the books found in our school library, and the faces were different from the ones in our text books. Because I found the writings of successful people who looked like me, I knew I was capable of great things from the fourth grade on. I also remember very briefly learning about slavery in my American history class. My history teacher was my favorite. She was so passionate and engaging. Unfortunately we glossed over slavery in about 10 minutes one day and never went back to it. When we got toward the end of the school year I asked her when we were really going to talk about slavery. By that point we had already started on WWI so she said she had not had enough time to discuss it. She did the same thing when I asked the next year about why our world history course consisted of an entire semester on European history. When were we going to talk about African, Asian, Latin American history...you know the rest of the world. She told me once again that we did not have enough time. She became so obviously uncomfortable I felt like she was lying to me. So I kept questioning her about why she had not planned more time for "the world" in world history. She eventually snapped at me and said she needed to prepare for the next class. I was so disappointed I stopped paying attention to her in class. Once I realized that something similar was going on in the other history classes I joined the African American History club. Then every time that teacher gave us a project I would find a way to work black/Mexican/Chinese... history into that project. If she wasn't going to teach us real American history than I was going to do it. I think its a shame how little things have changed in the classroom between the 1960's/70's and the early 2000's when I was in high school. After talking with my 16 year old niece I know there has been some progress and a lot of it has to do with the teacher. If the teacher cares about teaching the truly complex history of our world then the students will learn it in the classroom. Otherwise the few students who care will teach themselves outside of the classroom.